Why wait to communicate with your infant/ toddler? Join us for a interactive parent/child class that will help with language development! Through games, songs, books and fun, Weehands can make communicating with your little one that much easier. Prices vary by classes/ workshops. Please visit www.weehandswithangela.com for more details. Details: Signing Smart play classes and workshops in the MetroWest Boston area. Details: Classes run in 6 week sessions; or one-on-one training. Fees: 6-week series: $145-$157 (Music cds and sign language book included). Contact for discounts. Siblings attend for half-price. One FREE trial class. Details about business, classes, and discounts: Parent-child classes for ages 6 months- 6 years are held in Reading, Ma,at Reading Gymnastics Academy. Instructor is American Sign Language certified, as well as a licensed Elementary and Special Education teacher. Classes are fun, interactive and very creative! Sign language is taught through developmentally appropriate activities including, story-telling, circle-time, songs, movement and crafts. Parent and teacher workshops, as well as private classes, are also offered. Fees:Sign, Say & Play(R) classes:$135-140 for 6 week program; Parent Workshops:$60-$65 for a one time 90 minute-2 hour workshop; Private Parent Workshops & ECE training, please call for prices. Class tuition ($135-$140) includes SS&P(R) Kit.Parent Workshops for hearing parents/caregiver-pair and non-mobile babies.PW fees($60-$65/pair) include Parent Workshop Kit.Baby Signs(R) Private Parent Workshop in your home (call for fees).Early Childhood Educator Workshops for Preschools Daycare Centers. Each workshop fee includes a Baby SIgns(R) Prgrams classroonm kit of choice.Baby Signs(R) Programs Products. Details about business, classes, and discounts:Baby Signs(R) Classes for babies & parents/caregivers aged 6 months - 2 years.Sign, Say & Play(R) classes a 6 weekly, 45 minute Baby Signs® play class program designed especially for hearing parent/caregiver and their babies aged 6 months–2 years. 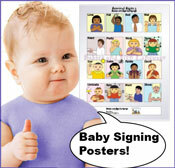 Return from "Infant Signing Classes in Massachusetts" to "Baby Sign Language home page"